Romanians and Bulgarians have been marking their first day as European Union citizens, 17 years after the fall of communism. Tens of thousands celebrated at midnight at concerts in the two capitals, Bucharest and Sofia. The Romanian president said EU entry was an "enormous chance for future generations", while Bulgaria's leader said it was a "heavenly moment". Their accession means the EU now has 27 members and half a billion people. EU dignitaries attended the midnight celebrations in Bucharest and were flying on to Sofia on Monday for further ceremonies there. EU Commission President Jose Manuel Barroso said: "In welcoming two new members in the family, we know our culture, our heritage, will be richer, our mutual ties and our economy will be boosted." Romanian President Traian Basescu said: "It was hard, but we arrived at the end of the road. It is the road of our future. It is the road of our joy." "We arrived in Europe. 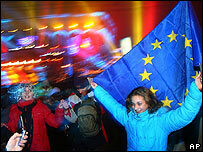 Welcome to Europe," Mr Basescu said on stage in University Square. Earlier, the EU flag was raised outside the government headquarters in Bucharest to the European anthem, Beethoven's Ode to Joy. On Monday morning young boys welcomed the new year in traditional style, cracking whips to chase away the evils of the past and ringing in the new with their bells. In Sofia, a pyramid of light illuminated the sky, and thousands of people in Battenberg Square cheered as midnight struck. In an emotional address to the nation, Bulgarian President Georgi Parvanov called the country's EU entry a "heavenly moment". "The day we are welcoming - 1 January 2007 - will undoubtedly find its place among the most important dates in our national history," he said. "But let's make it clear, our future success as a nation depends not on European funds and resources, but on our own work." On Monday morning everyday life appeared unchanged. "I feel normally, like every other day. There is no difference, except may be the weather is fine today," said a passer-by in Sofia. But Bulgaria has already had to make changes to comply with EU regulations. Overnight it closed down part of its only nuclear power plant because of EU safety rules. It also relaxed border controls at 15 crossings with EU members Greece and Romania, while strengthening them on its frontiers with Turkey, Serbia and Macedonia. The EU's expansion means the bloc now stretches as far east as the Black Sea. Romania and Bulgaria will now be subject to strict monitoring, to ensure they make more progress in the fight against corruption and organised crime. They face export bans on certain foods, and Bulgaria has been warned that 55 of its aircraft could be grounded unless they reach EU safety standards. Analysts say there is a risk that EU aid will be mis-spent, or just not taken up because the countries' institutions are too disorganised. There are also fears that the countries' economies will fail to compete with the rest of the EU's once trade barriers come down. Both Bulgaria and Romania are much poorer than the rest of the EU, with GDP per capita of about 33% of the EU average, compared with 50% in Poland. Some Western European member states fear a flood of new immigrants, but officials in both countries say most of those who wanted to work abroad have already left. Most of the 15 older EU member states have put in place restrictions on the free movement of workers from the two new members - though Finland and Sweden are two exceptions. Q&A: Restrictions to the UK?